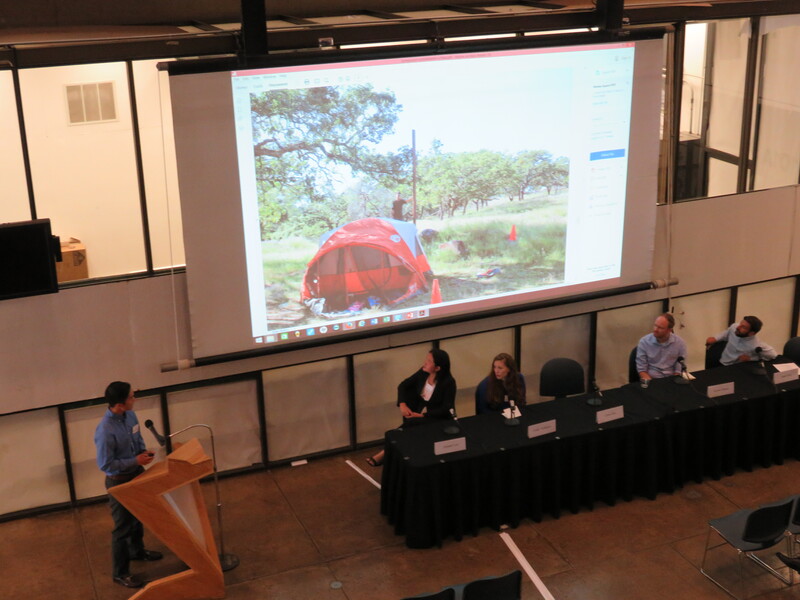 More than a year ago, ARC 503/L was presented with an opportunity to use transform the labors of an intermediate architecture design studio into a tangible experience: collaborating with the state’s Parks Forward Commission to redefine the lodging experience in the California Parks system. 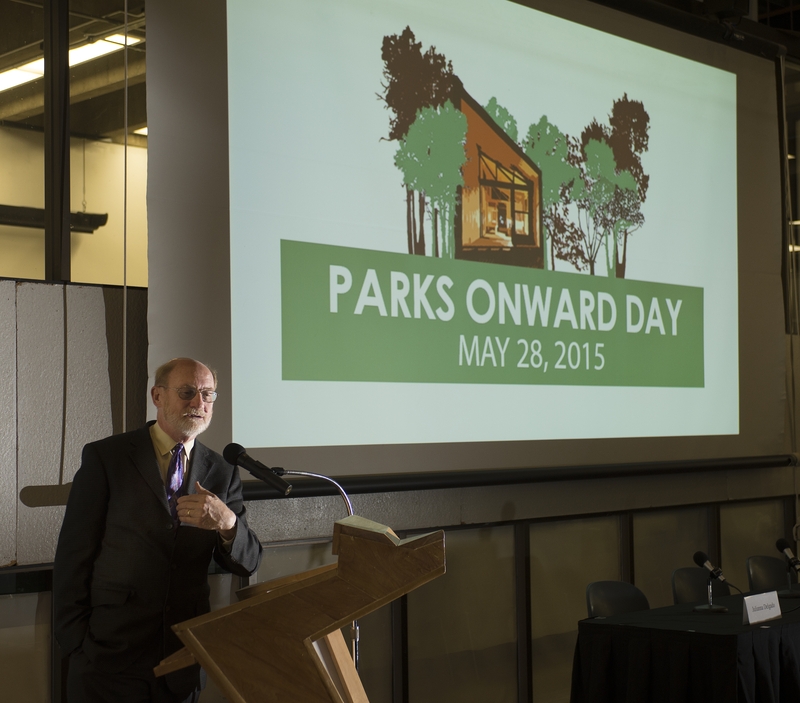 John Laird, California Secretary for Natural Resources, speaks at Parks Onward Day at the College of Environmental Design May 28, 2015. 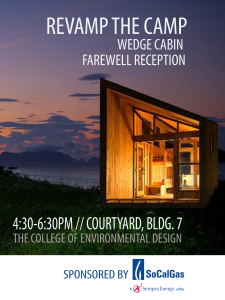 The 156-square-foot Wedge-style cabin was one of more than 10 distinctive cabin designs presented to Parks Forward commissioners, garnering so much interest that a prototype was built by Cavco West Industries to be showcased at the Sacramento State Fair in the summer of 2014. The project went on generate media attention from print, broadcast and online news outlets– 30 mentions and features by recent reckoning. It was featured in the May 28, 2015 symposium Parks Onward Day organized by the College of Environmental Design, introducing it to a wider audience of 135 comprised of state, regional and local policymakers, community organizations and park advocates. Notable speakers included Congresswoman Judy Chu and John Laird, California Secretary for Natural Resources. Two farewell receptions were held to give the project a proper send-off to its final destination at Spring Lake Park Campground in Sonoma County. The first, sponsored by the Southern California Gas Company, drew well-wishers such as West Covina Mayor Frederick Sykes, and Pomona councilmembers Paula Lantz and Debra Martin, as well as Arturo Jimenez, president of the Democratic Club of Pomona Valley. 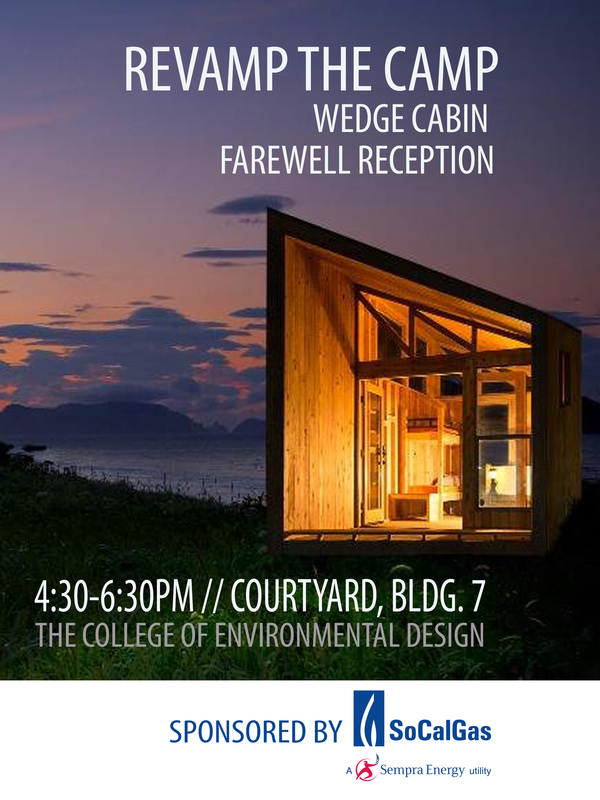 A second and final reception was held June 9 at ENV’s courtyard. Even then, students had a hand in its final transport after the moving truck had an accidental diesel spill; students and Prof. Lin stayed late to contain the fuel leak and assist with other moving-related tasks. That’s not the end of the Wedge cabin’s story. This spring students visited the Spring Lake Campground to help develop site design for three Wedge-style cabins. There, they evaluated existing campsites for cabin sustainability, floor plans, elevations/grades, and other specifications. This work, under the direction of park officials, will help Sonoma County Regional Parks system in the next stage: the bid, purchase and installation of three Wedge-style cabins in Fall 2015.